Sustainability remains high on the worldwide agenda in the cocoa sector as numerous problems threaten its viability. This study gives a broad picture of the Ghanaian cocoa sector and examines the initiatives of two Swiss chocolate manufacturers aiming at a more sustainable and future-oriented cocoa production in Ghana. The study reveals many challenges the Ghanaian cocoa sector is facing. The entire sector is highly regulated and controlled by the Ghana Cocoa Board (COCOBOD); the scope of influence of the private sector is limited. The COCOBOD shows rent-seeking behaviour and patronising attitudes. To attract investments from cocoa farmers, cocoa production would have to become a profitable business for them. The case study reveals that certification helps to increase both yields and income of the farmers. However, certification schemes are by far not sufficient to pull farmers out of poverty. As the projects of the two chocolate manufacturers focus on the diversification of the farmers’ income, they have the potential to improve the livelihoods of farmers. Because chocolate manufacturers, through their core business activities, cannot directly interact with farmers given the state control of the sector, its development is limited. Large-scale improvements of the whole cocoa sector go beyond the sphere of influence of chocolate manufacturers and must come from the Ghanaian government. The word sustainability is defined by the Oxford Dictionaries as “the ability to be maintained at a certain rate or level”. It originates from the two words sustain and ability. Sustainability is inextricably linked to social, environmental and economic issues (Glavic and Lukman, 2007, Sneddon et al., 2006 and Drexhage and Murphy, 2010). It means that something should be sustained over a long period of time (Costanza and Patten, 1995), but it is a dynamic concept linked to innovation (COSA, 2013 and Aerni, 2015). Although essential functions of an individual system should be preserved (in this case the cocoa production), this does not automatically imply that the system itself should not be altered and adapted. In the end, whether a particular system is sustainable can only be determined in the future, and therefore the contextualised definitions of sustainability are seen by Costanza and Patten as “predictions of actions taken today that one hopes will lead to sustainability” (Costanza and Patten, 1995). In the context of sustainability and sustainable development the private sector has a stake and plays an important role. This is where the concept of corporate social responsibility (CSR) and creating shared value (CSV) comes in (Porter and Kramer, 2011). Actions and initiatives resulting from CSR strategies are conscious decisions of the management to positively influence people and the environment affected by the company’s operations (Frederick, 2008 and Dubielzig and Schaltegger, 2005). As a result, the company is better connected to and embedded in society (Frederick, 2008). Consequently, CSR strategies, which are built on embeddedness, can enhance sustainable development (Frederick, 2008). In addition, the company creates shared value when it recognises specific demands in society and develops new business models or products to meet these needs (Porter and Kramer, 2011 and Pfitzer et al., 2013). It is a win-win situation for society and the private sector. According to Porter and Kramer, the idea of shared value goes even beyond the concept of CSR (Porter and Kramer, 2011). They claim that societal issues should be at the core of each business and not treated at the periphery by CSR programmes of the firm (Porter and Kramer, 2011). Pfitzer et al. give a variety of convincing examples of how the concept of shared value has positively influenced societies, especially in developing countries (Pfitzer et al., 2013). Sustainability is also a big issue discussed in the cocoa sector worldwide (Technical Centre for Agricultural and Rural Cooperation, 2013). The Global Cocoa Agenda states that “over the past decades, the global cocoa sector has been operating in an unsustainable manner raising concerns over its future” (Global Cocoa Agenda, 2012). Even though there are many different ways to achieve a more sustainable cocoa production (COSA, 2013), a holistic approach is crucial and has to go beyond certification (Cocoa Barometer, 2015 and Abidjan Cocoa Declaration, 2012). Cocoa experts agree that certification or a particular sustainability standard or label cannot be used interchangeably with the term “sustainable cocoa production” (COSA, 2013 and Cocoa Barometer, 2015) as the latter encompasses much more. Most of the 5.5 million smallholder cocoa farmers worldwide are living in poverty (Cocoa Barometer, 2015 and Consultative Board on the World Economy, 2010). Since cocoa originates from the rainforests of Central America and thrives in warm and wet climate, it grows in the tropical regions of Africa, South and Central America and Asia (Hütz-Adams, 2010 and The World Bank, 2011). However, these areas host important biodiversity hotspots (Ruf, 2007). The sustainability of the current system can be questioned given that yields are low worldwide and there is a lack of investments into cocoa by farmers (Consultative Board on the World Economy, 2010 and Schroth et al., 2016). The latter tend to expand the area under production instead of intensifying the production or rehabilitating old plantations (Ruf, 2007). Thus, cocoa production is a driver of deforestation and environmental degradation (Ruf, 2007 and Gockowski and Sonwa, 2010). Additionally, the farming population is ageing, revealing that cocoa is not attractive for young, better-educated people (Anyidoho et al., 2012). Hence, it is important to improve the economic situation of farmers by implementing practices that help to protect the environment at the same time (Ruf, 2007). West Africa produces around 70% of total world cocoa production – Ivory Coast is the largest and Ghana the second largest producer (Cocoa Barometer, 2015 and Hütz-Adams, 2012). The highest consumption of cocoa is in Europe (Cocoa Barometer, 2015 and Hütz-Adams, 2012). The value chain shows that most value-added happens at the end of the chain by the manufacturers and retailers in Europe and North America (Cocoa Barometer, 2015). The money does not accrue to the producers at the very beginning of the chain who heavily depend on exports (Hütz-Adams, 2013). The world market price adjusted for inflation is rather low nowadays compared to the early 1980s (Figure 1). 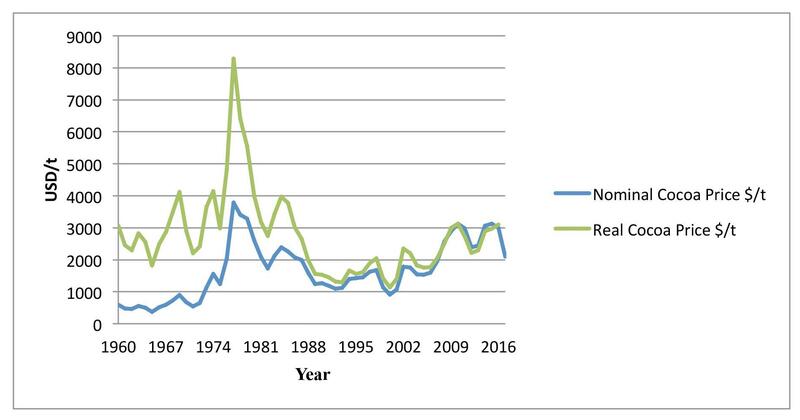 This means that the income situation for cocoa farmers has worsened over the past decades (Consultative Board on the World Economy, 2010 and Hütz-Adams, 2012). Thus, significant changes to sustain and intensify cocoa production are critical to turn it into a profitable and viable business for farmers and making it future-oriented. Since the future of the cocoa production is threatened due to the bad situation of cocoa farmers, many organisations including cocoa bean processors and manufacturers get engaged in activities that aim to achieve a more sustainable cocoa production and to mitigate supply deficits in the future (Barrientos et al., 2007 and Hütz-Adams and Voge, 2014). Furthermore, consumers’ concerns about the social and environmental conditions that surround cocoa production foster the engagement of firms (Barrientos et al., 2007, Gao et al., 2016, Auger et al., 2003 and Schneider and Schmidpeter, 2015). Several companies work with labelling organisations such as Rainforest Alliance, Fairtrade or UTZ; others have designed special projects to foster a more sustainable cocoa production and some combine both approaches (Cocoa Barometer, 2015). This study investigates if private sector initiatives lead to a more sustainable and future-oriented cocoa production. To do so, it focuses on the CSR initiatives carried out by two Swiss chocolate manufacturers in Ghana. The two enterprises, Läderach (Schweiz) AG and Chocolats Halba, can be seen as representative of the upper and medium price segment of the Swiss chocolate industry. Whereas Läderach is a family-owned business that sells high-quality and high-priced chocolates directly to consumers, Halba is a subsidiary of Coop (Swiss grocery retailer) and sells mid-priced chocolates to business customers. Both companies source most of their cocoa beans from Ghana. Even though Ivory Coast is the world’s largest cocoa producer, Ghana is Switzerland’s principal cocoa supplier. Central to this research is the question of whether the initiatives from the private sector lead to a more sustainable and future-oriented cocoa production in Ghana. To satisfactorily answer this question, it is important to consider key features of the Ghanaian cocoa sector and to comprehend how sustainable production is perceived. The first part of the study consists of a literature review, which is complemented with qualitative expert interviews. This part examines the social, economic, ecological and political issues concerning the Ghanaian cocoa sector and the current state of best farming practices. In total 17 experts were interviewed. The second part of the study is an analysis of the initiatives implemented by the two chocolate manufacturers in Ghana. The companies’ sustainability goals and status of implementation was assessed following qualitative interviews with employees knowledgeable of the companies’ sustainability initiatives. The impacts of the CSR initiatives were evaluated through quantitative surveys among participating farmers and controlled for external effects. The two companies buy only labelled beans, which is a common tool among chocolate manufacturers to attain a more sustainable cocoa production. The focus therefore was on the evaluation of the effects of certification. Additionally, each of the companies carries out a project in Ghana that goes beyond certification. These projects were in a pilot phase when this study was conducted. Hence, some initial indications could be gained about possible outcomes of the projects. For each case study a treatment and control group was created. Farmers that had been certified for less than three years (control group) were compared with farmers who had been certified for more than three years (treatment group). In total, 71 farmers from four villages were interviewed for the “Läderach” case study and 87 farmers from five villages for the “Halba” case study. Translators filled out the highly structured questionnaires together with the farmers. In the “Läderach” case study additional data was used from Olam Ghana (licensed buying company that works together with these farmers) that relates to the number of cocoa bags farmers sold in one year. This data is more accurate than the data gathered during the surveys since it is based on the records of Olam Ghana and not on the memory of the farmers. The following sections explain the challenges faced by the Ghanaian cocoa sector in different areas. The findings are obtained from the analysis of the expert interviews, unless otherwise stated. Furthermore, the results from the case studies are presented. The Ghanaian cocoa sector is heavily regulated and controlled by the Ghana Cocoa Board (COCOBOD). The COCOBOD is a governmental organisation that is mandated to sell cocoa on behalf of the farmers (Ecobank Report, 2014). Farmers are required to sell all of their cocoa through a licensed buying company (LBC) to the COCOBOD. The Cocoa Marketing Company, a subsidiary of the COCOBOD, is the only firm allowed to export cocoa (Ecobank Report, 2014). The COCOBOD determines the price for the farmers at the beginning of main crop season (starting in October) for one year. Irrespective of the quality, all farmers receive the same price per bag (Opuni, 2015). According to experts, it is problematic that the COCOBOD uses part of the cocoa revenue to subsidise fertiliser, pesticide and seedling distribution among farmers, to build roads, provide scholarships and construct schools in cocoa growing areas. 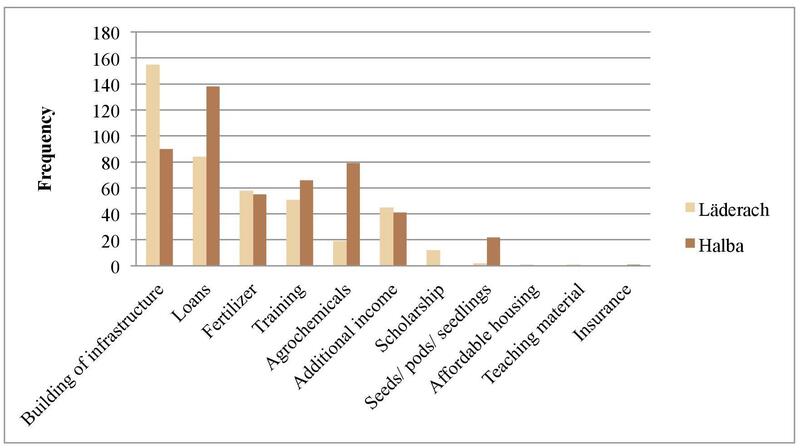 Spending in these areas directly reduces the price farmers receive for cocoa beans. Experts perceive this as rent seeking activities and patronising actions by the government. According to experts, this is particularly the case for the distribution of inputs, which is inefficient and reaches only part of the farmers. Additionally, experts state that farmers pay disproportionally high income taxes. Since the cocoa sector is controlled, it is much easier to collect taxes from cocoa farmers than from other farmers. Due to the strict quality control system of the COCOBOD, Ghanaian cocoa is considered to be the gold standard on the world market and therefore receives a price premium (Ecobank Report, 2014). Most experts agree that a certain regulation of the sector is beneficial. Generally, farmers seem to appreciate the fixed and stable prices (Knudsen and Foldi, 2010). However, there are divergent views on the extent of the regulation, the efficiency of the current system and the size of the COCOBOD. It is stated that the extreme extent to which the market is controlled nowadays tends to hinder sustainable development. To date, cocoa remains a major source of foreign exchange revenue for Ghana and is therefore very important for the country (Essegbey and Ofori-Gyamfi, 2012). Furthermore, it is an essential source of employment (Hütz-Adams, 2012); about one million Ghanaians depend directly on the sector (Hütz-Adams, 2012). According to experts, cocoa farmers seem to be better off than other rural dwellers, but most of them still live in poverty. Farmers sell on average around one ton of cocoa per year. Thus, the average income from cocoa is about 1700 USD per year (calculation done by the author with a producer price of 425 GHS per 62.5 kilograms). The high inflation of the Ghanaian cedi aggravates the situation. Farm sizes are small, and yields and producer price remain low. Currently, farmers receive about 60% of the world market price. The situation discourages farmers from investing in their farms. Most experts agree on the need to diversify the sources of income of the farmers and help them to first of all become food secure to improve their economic situation. It is crucial that farmers see cocoa farming as a business and have access to knowledge, loans and markets to boost their income. Experts also state that farmers should be allowed to process their cocoa beans to add value at the source of the value chain. Additionally, it is important to increase cocoa yields in an environmentally sound manner. As more and more land has been brought under cultivation, cocoa farming in Ghana has become a source of deforestation, environmental degradation and soil depletion. Interviewed experts stress the importance of applying production practices that increase soil fertility and biodiversity and foster the resilience of plantations against pests and diseases and climate change. Since cocoa can grow in combination with trees and other crops, most experts promote agroforestry systems that help to increase the biodiversity of the plantations and positively influence the microclimate. In their view it is critical to rehabilitate old farms to avoid further deforestation. The pros and cons of the use of pesticides and synthetic fertilisers are currently under debate. For some, it is unavoidable to use agrochemicals, while others claim that this is an unsustainable practice. The average yield of 450 to 600 kilograms of dried cocoa beans per hectare in Ghana reveals that farmers are not following the recommended good agricultural practices (GAP). Experts point out that realistic potential yields are about double the current yield. The farming population is ageing. According to experts, farmers’ children with a good education tend to move to the cities because of deficient infrastructure in rural areas and the low revenues offered by cocoa farming. This exacerbates an already problematic land tenure system. Many absentee farmers employ caretakers on their farms. These workers earn about one half or even only one third of the total revenues of the farms. Additionally, experts claim that the average farm size is rather low and that there is a lack of farmers’ organisations. The latter factor reduces the bargaining power of farmers and makes them more dependent on the COCOBOD. Child labour is not seen as a major issue specifically in the Ghanaian cocoa sector, but as a general problem in Ghana. It is suggested that the government address this issue in a holistic and comprehensive way. Facing these problems, Läderach and Halba want to improve the situation of cocoa farmers. For both companies, certification is a first step in this direction. Läderach purchases Rainforest Alliance certified beans and Halba partners with the biggest Fairtrade cooperative in Ghana, Kuapa Kokoo. Certification gives the two companies a basis that should exclude certain unsustainable practices such as child labour. Läderach is implementing its “family life” project in four farming communities. It consists in building or rehabilitating five boreholes for the farming communities such that they can access clean drinking water. Furthermore, Läderach wants to help farmers to establish a business besides cocoa farming. Therefore, a few farmers or their wives are invited to participate in a course about soap production or rearing of the greater cane rat. Läderach paid for the inputs to start the enterprises. However, it is unclear how many farmers will profit in the end. In Ghana, it is illegal to enter into a contract with farmers or farmers’ cooperatives to directly source cocoa beans. The Ghanaian government fixes the farm gate price. That is why Läderach cannot pursue its general strategy of sourcing beans directly from farmers or cooperatives and paying them higher and stable prices for high quality beans. Chocolats Halba wants to support farmers and to protect the environment by implementing a dynamic agroforestry system. At the core of this production system is the diversification of the farm, which leads to higher food security, increases the income of farmers and is beneficial for the environment. Extensive pruning and selective weeding should restore the quality of the soil (all organic matter is left on the ground for decomposition) and the diversity of the plantation should prevent the spreading of pests and diseases. With such a system, the productivity of cocoa can be increased by implementing environmentally sound production practices and its resilience against climate change is increased. The goal of Halba is to train 1000 farmers and to convince them to produce cocoa based on the dynamic agroforestry system. To do so, Halba partners with other organisations and receives third party funding for its project. The pilot project in Ghana has just started with a few farmers dedicating part of their plantation to the agroforestry approach. Despite the short span of time, there is already a visible difference between the conventional slash and burn approach and the dynamic agroforestry approach. This is shown in Figure 2 and 3. 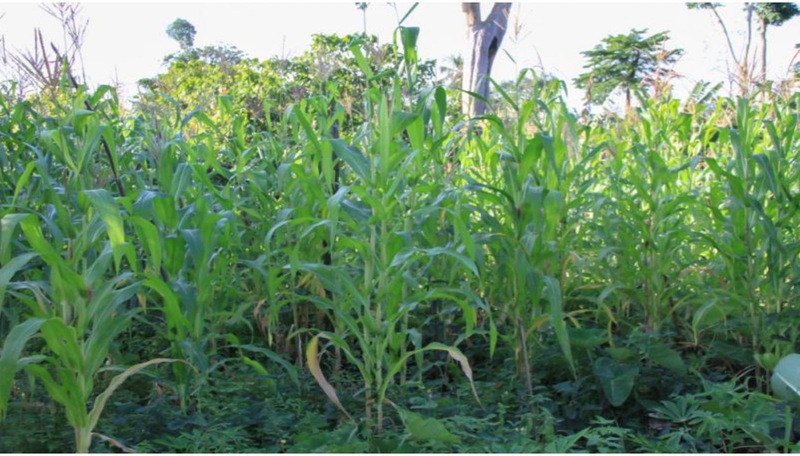 The pictures show the initial phase where food crops are dominating the plantation. They give evidence that the dynamic agroforestry approach leads to a much faster growth of these food crops. 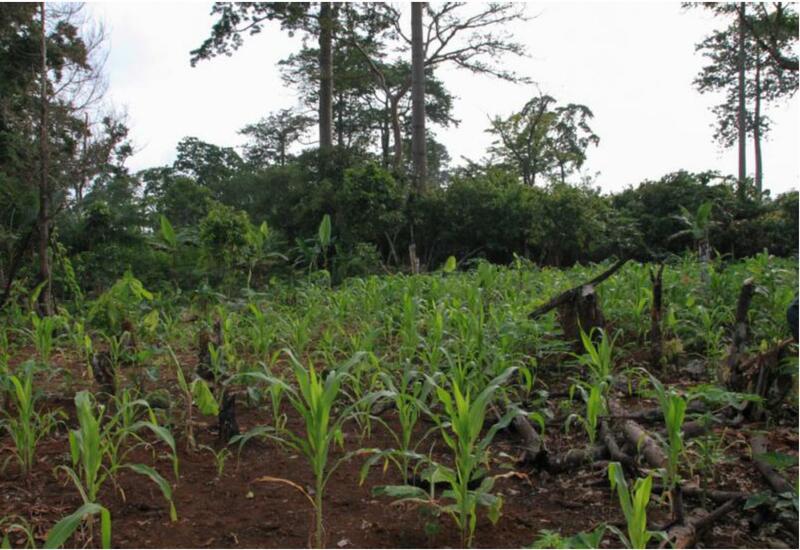 Figure 2 Dynamic agroforestry: newly established cocoa plantation after a few months. Figure 3 Slash and burn method: newly established cocoa plantation after a few months. 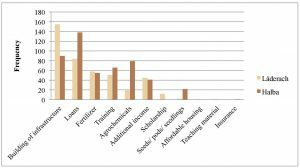 The results of the farmer surveys show that in both cases, certification helped to increase the yields and also the annual income of the farmers (Figure 4). 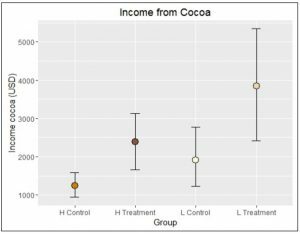 Although the difference between the treatment and control group in the gross income derived from cocoa is statistically significant, farmers from the treatment group in both case studies remain poor. In fact, farmers in both case studies stated their dissatisfaction with their economic situation and pointed out that their situation has worsened over the past years, irrespective of the duration of their participation in the certification programmes. 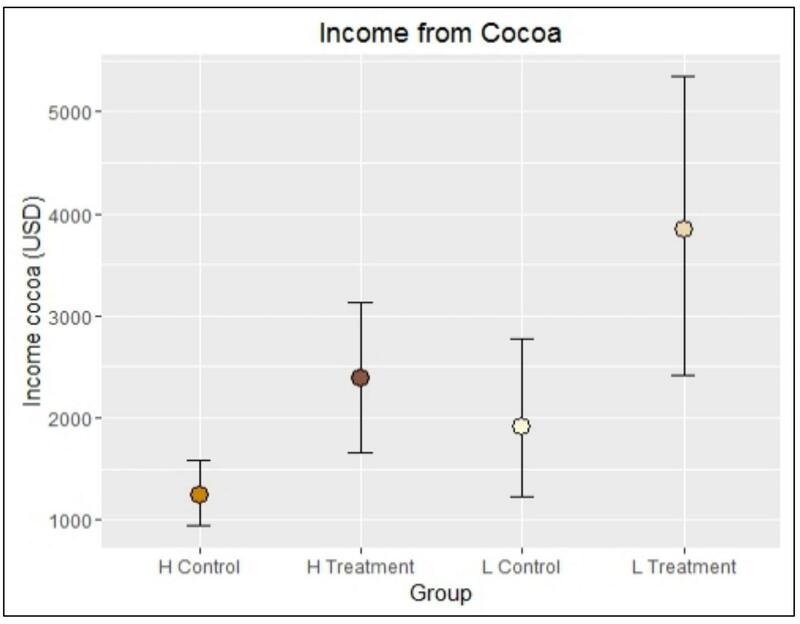 By looking at the factors that influence income, in the case study of Läderach, the income derived from cocoa depends more on the farm size than anything else. Furthermore, the income and yields were more closely related to the specific community farmers are living in than the certification. Thus the main determiner of the income can hardly be influenced by Läderach’s operations. In the Halba case study, the correlation between the farm size and the community and income of farmersis weaker. In the Läderach case study, data from Olam Ghana was used from the cropping season 2014/2015 regarding the number of bags farmers sold to Olam Ghana. In the case of Halba, data derived from the farmer interviews was used. The error bars show the 95% confidence intervals. The independent t-test shows a significant difference between the L Treatment (M= 3846, SE=746) and L Control (M= 1912, SE=408; t(45.5) = -2.28, p < 0.05) and between H Treatment (M= 2383, SE= 372) and H Control (M= 1251, SE= 165; t(69.8) = -2.78, p < 0.01). Part of the higher yield recorded for the treatment groups is due to somewhat better farming practices of these farmers. However, from the results of both case studies, no clear conclusion can be drawn about which production methods really influence yields. When considering environmental aspects like the number of shade trees per hectare there is no difference between the treatment and control group in both case studies. But because many farmers experienced drought the year before, most of them are willing to increase the number of such trees on their farms. Assessing the use of inputs such as agrochemicals and fertiliser, farmers in the Läderach case study rely on supplies from the COCOBOD. None of the Läderach farmers bought fertiliser or pesticides on their own, but not all farmers had access to free inputs from the COCOBOD. On the other hand, nearly all farmers from the Halba case study used fertiliser and pesticides. These farmers were also willing to buy inputs from private sellers. Likewise not everyone in this group received inputs from the COCOBOD. Farmers are willing to invest in their farms but lack the financial means. When asked to identify and prioritise their needs, building of infrastructure ranked high in both case studies, reflecting the situation in rural Ghana (Figure 5). Often essential infrastructure such as boreholes, paved roads, schools and medical centres is lacking. Furthermore, farmers would like to access bank loans and free inputs such as fertilisers or agrochemicals. The request for inputs is in conflict with the sustainability objectives of the companies. However, it also shows that farmers are struggling to buy inputs given the low farm gate price for cocoa and the lack ofaccess to financial means. Farmers could give their three priorities for how the chocolate manufacturers should support them. To their first priority three points were given and to their second and third two and one point, respectively. Nearly all children of the interviewed farmers in both case studies go to school and are able to complete primary education. However, the schoolchildren might not be at the right grade for their age. Interestingly, farmers from the Läderach case study do not mind their children becoming cocoa farmers. On the contrary, the farmers from the Halba case study do not want their children later on to work on the farms. Reasons for this might be that more children in the Halba case study reached higher education compared to the Läderach case study and the farmers’ income in the Läderach case study is higher than the one of the Halba farmers. Hence, cocoa farming is a more attractive option for the farmers’ children of the Läderach than of the Halba case study. Furthermore, the answer to this question also depends on the farmers’ understanding of the term “cocoa farmer”. Some also consider themselves to be cocoa farmers when they are the owner of the plantation but engage a caretaker to work on the farm. The central research question of whether the initiatives of the private sector lead to sustainable and future-oriented cocoa production in Ghana cannot be easily answered. The results from the expert interviews and the literature review reveal that it tends to be difficult for chocolate manufacturers to engage with farmers and to foster a more sustainable and future-oriented cocoa production. Challenges faced by the cocoa sector in Ghana, such as land tenure, farm size and farm gate prices, go beyond the scope of influence of the private sector. The institutional framework conditions in Ghana prevent private companies from directly interacting with cocoa farmers and integrating them into the value chain. It is impossible for the firms to embed in the local context. The extent to which certification can improve the farmers’ situation is limited. Nevertheless, some positive effects from the CSR initiatives of the two chocolate manufacturers are found in both case studies. Chocolate manufacturers have a very limited scope to influence different areas of the Ghanaian cocoa sector. The COCOBOD fixes a single price for cocoa such that farmers cannot receive premiums for higher qualities. Chocolate manufacturers cannot influence this pricesetting as they are not allowed to negotiate with farmers. The consequence is that the firms are not able to directly alter the economic situation of the farmers through premium payments that would lead to higher farm incomes. The only possibility to pass on higher prices to farmers is through certification schemes that provide premiums. However, a big portion of the premium money is used by the COCOBOD and the LBCs to guarantee the traceability of cocoa. Another major part of the premium money is used to pay the training that farmers receive in order to comply with the standards of the label. The little premium money that reaches the farmers does not substantially change their situation. This was also found in the COSA study (COSA, 2013). Farmers receive less than 60% of the price that the manufacturers pay. Even though the COCOBOD provides certain services to farmers, they are taxed heavily. This is considered to be rent seeking by the government. Tax revenues from cocoa are then used to fund rural and urban development. While cocoa farmers pay disproportionally high taxes, farmers that deliver food crops to local markets cannot be taxed at all due to the lack of institutional framework. Ghanaian cocoa beans are normally of excellent quality. Although this leads to a price premium on the world market, it might discourage interventions from the side of processors and manufacturers. Companies do not have to engage with farmers to get high-quality beans. There is also no need and no possibility to pay higher prices to farmers that deliver good quality. Additionally, it is difficult to assure that the cocoa beans from farmers who profit from a certain intervention of a company are sold to this company. Since the beans pass through the LBC and the COCOBOD it is difficult to receive specific beans; this is particularly the case for small amounts. In the area of quality control, collaboration between the quality control unit of the COCOBOD and chocolate manufacturers might benefit both sides as well as the farmers. One area chocolate manufacturers can influence is the yield and the diversification of farmers’ income. Through training, GAP can be passed on to farmers and the start of other businesses besides farming can be facilitated. Training in GAP can also tackle environmental issues. Firms could incentivise the planting of shade trees on the plantations to compensate for CO2 emissions. However, the training of farmers is not a business case for the processors and manufacturers per se. Still, there is a particular motivation for the companies to engage directly with farmers. This motivation is based on the fear of supply deficits, which would provoke higher world market prices, or can reflect a marketing strategy and mitigate bad press about the company. Since consumer awareness is rising, manufacturers’ sustainability initiatives can be used as a purchasing argument. Social issues such as land tenure systems and child labour are not unique to the cocoa sector in Ghana. They are systemic problems that need to be addressed at the national level and require a holistic approach. However, this goes beyond the duties of chocolate manufacturers. Generally, initiatives of the private sector that are built on voluntary standards have limited influence to combat the violation of human rights and environmental degradation (Cocoa Barometer, 2015). For Läderach and Halba, certification helps to exclude certain unsustainable and unethical practices in the value chain. However, audits are often not capable of detecting all non-conformities with the standards on the farms (Cocoa Barometer, 2015). The right framework conditions and legal settings must be in place to foster sustainable cocoa production (Cocoa Barometer, 2015). Thus, the effectiveness of sustainability initiatives depends for the most part on the local context (COSA, 2013). Although there have been many interventions in the Ghanaian cocoa sector over the past years, major problems persist. This raises doubts on the effectiveness of past initiatives by the private sector, NGOs and the Ghanaian government. The overall strategy of Läderach is to achieve a win-win situation through strong relationships and direct contracts with cocoa producers. The resulting stable prices and superior quality of cocoa benefits both parties. This is consistent with the idea of CSV by Porter and Kramer (Porter and Kramer, 2011). However, in the context of the Ghanaian cocoa sector, Läderach is not able to pursue its strategy due to adverse institutional framework conditions. Läderach cannot enter into contractual agreements with farmers or farmer groups. Even though Läderach is willing to pay higher prices for quality cocoa, the institutional framework in Ghana makes this impossible. In this case the COCOBOD prevents the farmers from receiving higher farm gate prices instead of supporting them. Similarly, Halba cannot source their cocoa beans directly from farmers of the Fairtrade cooperative. Since the Rainforest Alliance and Fairtrade certification schemes include training, certified farmers acquire basic knowledge of good farming practices and can improve their farming skills. Furthermore, environmental protection is also a subject of the training sessions. However, only a small percentage of the premium money reaches farmers. As a consequence, the economic situation of farmers does not improve directly through the certification schemes. On average, farmers state that their situation has worsened over the past decade. The negative trend could not be reversed by price premiums for certified cocoa, training which should lead to improved yields and the increased nominal farm gate prices in the local currency. This suggests that the price increases at the farm gate – including benefits farmers receive from certification schemes – do not adequately compensate for inflation. The case studies demonstrate that certification schemes alone do not change the livelihoods of the farmers in Ghana. Especially in the Läderach case study, the primary factor that determines income is the farm size; something chocolate manufacturers can hardly influence. However, since the projects of both chocolate manufacturers focus on income diversification of farmers, they might have the potential to improve the livelihood of farmers. Additionally, the implementation of the dynamic agroforestry system by Halba could become important to fostering an environmentally sustainable production. The request by farmers for better infrastructure corroborates with the view of experts that certain infrastructure is lacking in rural areas. Furthermore, farmers request input supply. This gives evidence that the price they receive for their cocoa is not high enough to buy the necessary inputs by themselves. This also explains their request to access financial services. By comparing both case studies, it is apparent that the starting positions of the firms are rather different. However, the two companies have similar approaches in Ghana to reach a more sustainable cocoa production: Both work with labelling organisations and implement projects beyond certification. The content and implementation of the projects look different. Läderach uses the Rainforest Alliance certification to ensure environmental sustainability and social standards. Läderach’s “family life” project centres on the improvement of the farmers’ economic situation and livelihood. The Fairtrade certification helps Chocolats Halba to reach farmers and to introduce their project. The project of Halba combines environmental protection, climate change mitigation, training on farming practices and the increase and diversification of the income of the farmers. While cocoa production is an integral part of the project of Halba, the additional project of Läderach does not include it. Also, the reach and size of the projects differ substantially. Läderach is self-funding its projects, while Halba receives third-party funding. This indicates that companies selling mid-priced chocolate are struggling to implement extensive sustainability initiatives which have a large and positive impact on farmers and still achieve high enough revenues. Hence, such initiatives may lack economic viability for the company itself. From an economic perspective, both studies show that the projects do or will benefit the farmers in Ghana but not necessarily directly benefit the chocolate manufacturers. They seem to be mostly of philanthropic nature or show a developmental aid character, especially in the case of Läderach. This does not correspond to the idea of shared value by Michael Porter and Mark Kramer (Porter and Kramer, 2011). Of course, both companies benefit from indirect positive effects like good reputation and motivated farmers and employees. Halba uses its CSR initiatives as a marketing instrument. Additionally, environmental protection and climate change mitigation are important also for firms, since they too depend on natural resources. 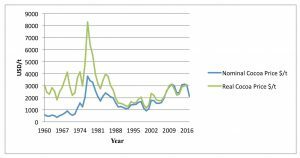 By looking at the Ghanaian cocoa sector it can be clearly seen that major changes are needed in order to sustain the production. To be sustainable and future-oriented it should not only be sustained but developed into a thriving business for farmers. Therefore the income of farmers must be doubled or even tripled. This can only be achieved by substantially increasing yields, producer price and farm sizes, and simultaneously diversifying the source of income of farmers. Intensification must take place, however, in an environmentally sound way, so that farmers can achieve high productivity without further expanding the farms into the last remaining patches of forest. Structural changes are needed in order to increase the farm sizes. This in turn would require more jobs in other sectors in the region to absorb the labour force getting out of cocoa farming. The study reveals the challenges chocolate manufacturers face in promoting sustainable development of the Ghanaian cocoa sector. Since the entire sector is highly regulated and controlled by the COCOBOD, the scope of influence of the private sector is limited. However, by training farmers about good agricultural practices, yields can be increased, and environmental concerns addressed. But, issues about land tenure and higher farm gate prices are out of the scope of chocolate manufacturers. Hence, it is crucial that the COCOBOD steps back and encourages the private sector to engage with farmers and take over the input supply. The COCOBOD should abandon the inefficient input supply subsidisation and rather focus on the transfer of knowledge to the farmers. Private-public partnerships could be valuable in this area. Also, collaborations between companies that are interested in high-quality beans and the quality control unit of the COCOBOD might be beneficial. It is important that firms would be allowed to pass on higher prices to farmers that deliver excellent quality. Since certification does not help to sufficiently increase the income of farmers, other measures must be introduced to increase the producer price. This should also include the lowering of the tax burden on farmers. In conclusion, the two chocolate manufacturers could positively influence the situation of farmers through certification schemes and projects. However, large-scale improvements of the whole sector go beyond the scope of influence of the companies. Those policies must come from the Ghanaian government. A clear strategy and holistic approach are needed to do so. Acknowledgements: I am very grateful to Constantine Bartel and Isabelle Schluep for providing comments on the draft version of this paper. Abidjan Cocoa Declaration (2012). World Cocoa Conference. Available online: https://www.icco.org/home/world-cocoa-conference-2012.html. Anyidoho, N. A., Leavy, J., Asenso-Okyere, K. (2012). Young people’s aspiration in agriculture: a case study of Ghana’s cocoa sector. Paper for Young People, Farming and Food: International Conference on the Future of the Agrifood Sector. University of Ghana, Legon. Aerni, P. (2015). Wie zukunftsfähig ist der Nachhaltigkeitsbegriff?. Denaris, 4: 6–9. Auger, P., Burke, P., Devinney, T. M., Louviere, J. J. (2003). What will consumers pay for social product features?. Journal of Business Ethics, 42: 281–304. Barrientos, S. W., Asuming-Brempong, S., Sarpong, D., Anyidoho, N. A., Kaplinsky, R., Leavy, J. (2007). Mapping Sustainable Production in Ghanaian Cocoa. Report to Cadbury. Cocoa Barometer (2015). Available online: http://www.cocoabarometer.org/Home.html. Consultative Board on the World Economy (2010). Draft Inventory of Diversification Practices on Cocoa Farms. Twenty-second meeting, London. Available online: https://www.icco.org/about-us/international-cocoa-agreements/cat_view/30-related-documents/32-consultative-board-on-the-world-cocoa-economy.html. COSA (2013). The COSA Measuring Sustainability Report: Coffee and Cocoa in 12 Countries. Philadelphia, PA: The Committee on Sustainability Assessment. Costanza, R. and Patten, B. C. (1995). Defining and predicting sustainability. Ecological Economics, 15: 193–196. Dubielzig, F. and Schaltegger, S. (2005). Corporate Social Responsibility. Handlexikon Public Affairs: 240–243. Drexhage, J. and Murphy, D., (2010). Sustainable Development: From Brundtland to Rio 2012. United Nations. Background Paper prepared for the consideration by the High Level Panel on Global Sustainability at its first meeting, 19 September 2010. Ecobank Report (2014). Ghana: Cocoa sector is facing new challenges, Middle Africa Briefing Note/ Soft Commodities/ Cocoa. Available online: http://www.ecobank.com/upload/20140723100236691535ay7ctp5kPP.pdf. Essegbey, G. O. and Ofori-Gyamfi, E. (2012). Ghana Cocoa Industry – An Analysis from the Innovation System Perspective. Scientific Research, Technology and Investment, 3: 276-286. DOI: 10.4236/ti.2012.34038. Frederick, W. C. (2008). Corporate Social Responsibility: Deep Roots, Flourishing Growth, Promising Future. The Oxford Handbook of Corporate Social Responsibility. DOI: 10.1093/oxfordhb/9780199211593.003.0023. Gao, Y., Mattila, A. S., Lee, S. (2016). A meta-analysis of behavioural intentions for environmental-friendly initiatives in hospitality research. International Journal of Hospitality Management, 54: 107-115. DOI: 10.1016/j.ijhm.2016.01.010. Glavic, P. and Lukman, R. (2007). Review of sustainability terms and their definitions. Journal of Cleaner Production, 15: 1875–1885. Gockowski, J. and Sonwa, D. (2010). Cocoa Intensification Scenarios and Their Predicted Impact on CO2 Emissions, Biodiversity Conservation, and Rural Livelihoods in the Guinea Rain Forest of West Africa. Environmental Management, 48: 307–321. DOI 10.1007/s00267-010-9602-3. Hütz-Adams, F. (2010). Menschenrechte im Anbau von Kakao, Eine Bestandsaufnahme der Initiativen der Kakao‐ und Schokoladenindustrie. INEF Forschungsreihe Menschenrechte, Unternehmensverantwortung und Nachhaltige Entwicklung, 8. Duisburg, Institut für Entwicklung und Frieden, Universität Duisburg‐Essen. Hütz-Adams, F. (2012). Vom Kakaobaum bis zum Konsumenten. Die Wertschöpfungskette von Schokolade. SÜDWIND e.V. – Institut für Ökonomie und Ökumene, Siegburg. Available online: http://www.suedwind-institut.de/fileadmin/fuerSuedwind/Publikationen/2012/2012-18_Vom_Kakaobaum_zum_Konsumenten._Die_Wertschoepfungskette_von_Schokolade_download.pdf. Hütz-Adams, F. (2013). Flächenkonkurrenz – Das Beispiel Kakao. SÜDWIND e.V. – Institut für Ökonomie und Ökumene, Siegburg. Available online: http://www.suedwind-institut.de/fileadmin/fuerSuedwind/Publikationen/2013/2013-12_Flaechenkonkurrenz_-_das_Beispiel_Kakao.pdf. Hütz-Adams, F. and Voge, A. (2014). Zur Plausibilität der Best Practice Kriterien. SÜDWIND e.V., Institut für Ökonomie und Ökumene, Siegburg. Available online: http://www.suedwind-institut.de/fileadmin/fuerSuedwind/Publikationen/2014/2014-03_Best_Practice-Studie_Kakao.pdf. Knudsen, M. H. and Fold, N. (2010). Land Distribution and Acquisition Practices in Ghana’s Cocoa Frontier: The Impact of a State-Regulated Marketing System. Land Use Policy, 28: 378–387. DOI: 10.1016/j.landusepol.2010.07.004. Opuni, S. K. (2015). Report of the Technical Committee of Producer Price Review Committee (PPRC) for the 2016/15 Cocoa Season. Chief Executive COCOBOD. Pfitzer, M., Bockstette, V., Stamp, M. (2013). Innovating for Shared Value. Harvard Business Review: 1–9. Porter, M. E. and Kramer, M. R. (2011). Creating Shared Value. Harvard Business Review: 1–17. Ruf, F. (2007). The Cocoa Sector, Expansion, or Green and Double Green Revolutions. Background Note, Overseas Development Institute. Available online: https://www.odi.org/sites/odi.org.uk/files/odi-assets/publications-opinion-files/586.pdf. Schroth, G., Läderach, P., Martinez-Valle, A. I., Bunn, C., Jassogne, L. (2016). Vulnerability to climate change of cocoa in West Africa: Patterns, opportunities and limits to adaptation. Science of the Total Environment, 556: 231–241. Sneddon, C. Howarth, R. B. and Norgaard R. B. (2006). Sustainable development in a post-Brundtland world. Ecological Economics, 57: 253–268. Technical Centre for Agricultural and Rural Cooperation (2013). Cocoa Sector. Agritrade, Informed Analysis, Expert Opinions, Executive Brief. Available online: http://agritrade.cta.int/Publications/Executive-briefs#page=/(offset)/10/(nodeid)/5858. The World Bank (2011). Supply Chain Risk Assessment, Cocoa in Ghana. Report Number 1234567.